My apologies for neglecting my blog during the last month. 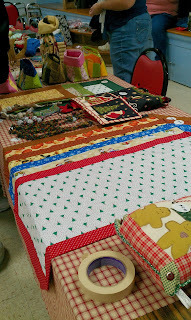 I was having all kinds of crafting fun making things for the bazaar at my church last weekend. I made tablerunners from the 10-Minute Tablerunner pattern that you can find by doing a google search for it. They do take a bit more than ten minutes, but are super-easy and turned out to be a good seller. I also had lots of fun making these zippered bags from a pattern from Atkinson Designs. I also made travel pouches for pierced earrings to match each bag. If I were doing the 101 scrap projects that Amanda Jean is doing over at Crazy Mom Quilts, the brown bag and blue bag would be scrap projects #1 and #2. The big hit was these wine gift bags that I made from a pattern called "All Corked Up," but I would guess that you can find a similar pattern on the internet.